US road champion George Hincapie had surgery on his left wrist Wednesday, and looks almost certain to miss Paris-Roubaix April 15. 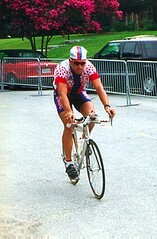 "The surgery went well, straightforward and no complications," Discovery Channel sporting director Johan Bruyneel told the AFP. "Now we just have to wait and see how he recovers." Bruyneel believes that Hincapie will recover quickly, as he did after breaking his wrist in Paris-Roubaix last year, but thinks the very nature of the Hell of the North will keep Hincapie out of the race. 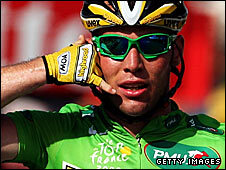 "He will be able to ride his bike pretty soon, but it's not very realistic to think about Paris-Roubaix," Bruyneel said. "It's not just a Classic. It's the cobblestones. That's the issue." This year's edition of Paris-Roubaix features an extra section of cobbles, the Chemin du Moulin, in addition to the 27 cobbled sections riders negotiated last year. So U.S. road champ George Hincapie will be celebrating the win in style all year, on this gorgeous Trek/Disco Team 5500. The photo is by Flickr user ebbe, who shot the team January 23rd. Follow the link to see more from his photo shoot. 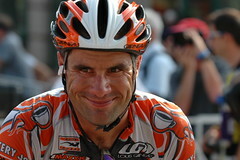 Leipheimer and Hincapie: too friendly too soon? 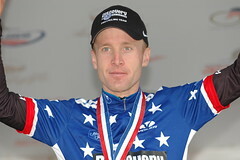 Over at PezCycling News, Jered Gruber gives major, and deserved, props to Jelly Belly's Andy Bajadali, who went toe-to-toe with Hincapie and Leipheimer until the last few miles of the race. 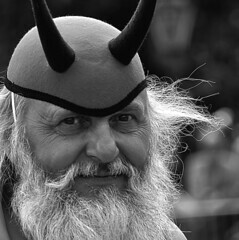 Conversely, Gruber's not happy that Leipheimer would work so clearly for Hincapie. The two tag-teamed Bajadali late, and finally beat him down after repeated attacks. 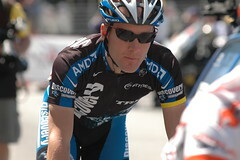 Leipheimer, with no other Americans on the Gerolsteiner squad and thus no teammates, cozied up to his team for 2007, Discovery Channel. He got his feeds out of the Discovery car, and carried bottles up to Hincapie. 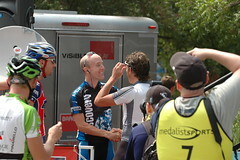 I have to agree that it looked like Leipheimer was the strongest guy on Sunday. He spent more time in front of the pack than some drum majors. I think he's opening his Discovery Channel account a little early, a pretty common thing for the pros. 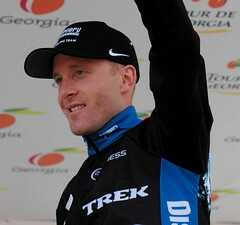 This way, Discovery gets a US champ, and Leipheimer has earned some loyalty in return from Hincapie next season. Discovery Channel's George Hincapie took the biggest win of his season yesterday, winning the US road race championship. 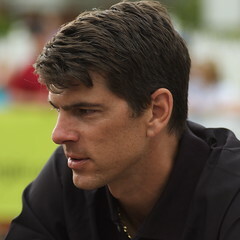 WIth a new course that covered roads near his house on Paris Mountain, and a new format that excluded amateurs and non-U.S. riders, Hincapie had only Jason McCartney as official team support, but Dave Zabriskie and Levi Leipheimer (about to join Discovery Channel) acted as de facto teammates. 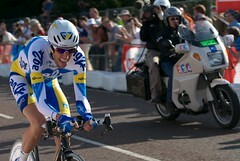 McCartney and Zabriskie pushed the pace hard on the day's first trip up Paris Mountain, and -- boom! -- 40 riders were dropped. Next trip up the mountain, another 30 were shed. 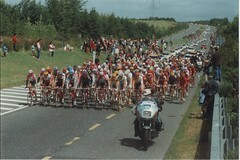 On the day, only 31 riders would complete the race. 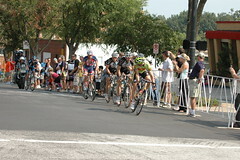 TIAA-CREF was the biggest team in the field, and placed 6 riders in the final 17 who led the pack in the 4th lap. 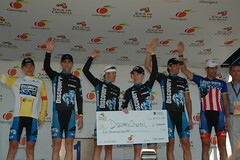 Over the top of the mountain, only 9 riders survived, including TIAA-CREF's Danny Pate and Blake Caldwell, Navigators' Phil Zajicek and Burke Swindlehurst, Jelly Belly's Andy Bajadali, defending champ Chris Wherry of Toyota-United, KodakGallery's Ben Jacques-Maynes, Leipheimer, and Hincapie. The gap to the rest of the field was so large that only these 9 were allowed to enter the final circuit, with another 22 given prorated times. On the day's final trip up Paris Mountain, everyone knew Leipheimer, who last week set a new record for the climb at 8:54, and Hincapie would go for broke, and Hincapie got a 15-second gap at the summit. 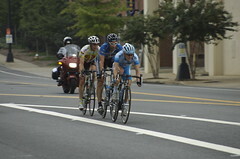 On the way into the city, Bajadali and Leipheimer recaptured Hincapie, and the trio worked together briefly, before Hincapie launched on the finishing circuits, and Leipheimer could see that Bajadali was through. He bridged up to Hincapie and did most of the work on the last lap, before Hincapie attacked in the last kilometer, taking a 10-second lead that would hold up to the finish. I've got a Flickr photoset up with about 60 pictures from the day, including Hincapie kissing podium girl Melanie Hincapie, the Hincapie family celebrating at the start/finish, the Hincapies with their daughter, action shots of Zabriskie, Leipheimer , and Hincapie. There's also a USA Cycling Pro Championships pool. 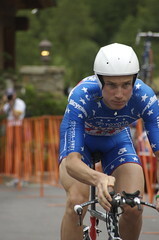 Team CSC's Dave Zabriskie profited from a late slip by defending US TT champ Chris Baldwin to take the US professional time trial title. 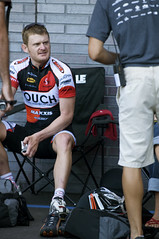 The race, in Greenville, SC, was missing George Hincapie and Levi Leipheimer, both on hand but sitting out the TT, and Floyd Landis, awaiting the results of his doping case. Baldwin was reportedly leading by 8-11 seconds going into the last turn of the course, but missed the turn and rode into a ditch. By the time he got on his replacement bike and covered the last 400 meters up to the line, he had lost the better part of a minute, finishing 32 seconds behind Zabriskie. 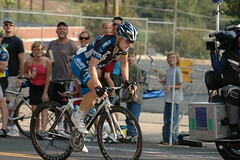 Zabriskie won the open title in 2004, when elite amateurs and pros raced head-to-head. "I'm not one to make excuses, but I kind of wanted to throw up a lot when I was warming up," Zabriskie said. "Something weird happened to the head. I think I was nervous for the first time in my life today. Everyone was saying ‘Zabriskie is going to win' all week, and I think it got to me a little bit." Zabriskie was clearly nervous before the start, circling like a shark near the start house and riding quick hill sprints to prepare for the race. 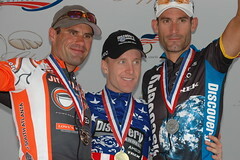 Discovery Channel's Jason McCartney was 3rd on the day. 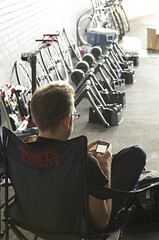 Zabriskie plans to compete in the world TT championship in Salzburg in 3 weeks. I made the start and the finish line, but caught pretty much just the last few starters and finishers, but that included Zabriskie, Baldwin, McCartney and 9 of the top 15 finishers. 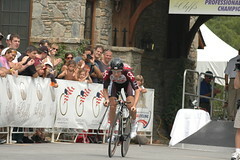 My 2006 USA Cycling Pro TT championship photoset at Flickr has all the best shots, and bonus shots of George Hincapie and Levi Leipheimer, who rode up soon after the race finished. Also of Mrs. Hincapie, who was serving as presenter at the awards ceremony. Also racing today was the “Race to Replace” winner, A.J. 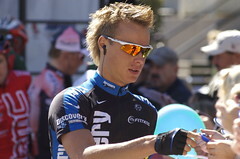 Smith, riding in Discovery Channel colors. His time, 47:42, was better than 5 of the competitors.